Received May 21, 2018; Revised July 8, 2018; Accepted July 9, 2018. Heat stress is one of the most important factors limiting growth and productivity of wheat. In the present study, gene action, general (GCA) and specific (SCA) combining ability of cellular thermotolerance were studied in a nine-parent half diallel cross of bread wheat evaluated under normal (1st sowing date) and heat stress (late sowing date) conditions. The cellular thermotolerance was estimated based on cell membrane thermostability (CMS) and tetrazolium chloride (TTC) reduction. Grain yield/plant (GYP), 1000-kernel weight (TKW), stem diameter (STD) and heat tolerance index (HTI) were measured. Compared with their parents, F1 hybrids significantly produced higher GYP, CMS, TTC and HTI. Highly significant mean squares of GCA and SCA effects were observed for all traits with GCA mean squares being much larger than that of SCA. Highly significant additive (a) and non-additive (b) gene actions were observed for all the traits with a predominance of the additive gene actions. However, the dominance genetic variance of CMS and TTC was greater than the additive variance. Moderate to high narrow-sense heritability was obtained for CMS (0.52), TTC (0.57) and HTI (0.71). GYP was significantly correlated with CMS (r = 0.62), TTC (r = 0.63) and HTI (r = 0.60). A highly significant positive correlation was obtained between CMS and TTC (r = 0.73), supporting that CMS and TTC could be used as efficient criteria for selecting wheat genotypes under heat stress. The parents P9, P1 and P2 were identified as best general combiners for CMS, TTC and HTI respectively. Six crosses were identified as best promising combinations for CMS (P1 × P8 and P5 × P9), TTC (P4 × P9 and P5 × P6) and HTI (P1 × P2 and P8 × P9). Thus, inclusion these superior genotypes into breeding programs could be useful for improvement of heat tolerance in wheat. Heat stress is one of the most important abiotic stresses limiting growth and productivity of crop plants including wheat. The problem is becoming increasingly serious nowadays due to the “greenhouse” phenomenon resulting from the excessive emission of CO2 from industry into the air. Under continual heat stress, the duration of developmental stages is reduced by shortening of the life cycle resulting in few and small organs (Stone 2001). High temperature acts directly on the developing grains by reducing the duration of grain filling and impairing photosynthesis and starch accumulation (Fokar et al. 1998). The cellular thermotolerance was considered as an indication of heat stress tolerance in wheat (Blum et al. 2001). In addition, membrane thermostability showed strong genetic correlations with grain yield in wheat, and thus it can be used as an indicator for heat tolerance (Ni et al. 2018). Several methods have been used for evaluating heat tolerance of crop plants; including CMS assay (Blum and Ebercon 1981; Chen et al. 1982) and TTC test (Blum 1988). The CMS technique was firstly developed in wheat by Blum and Ebercon (1981). It is based on measuring the amount of the electrolyte leakage from leaf discs or leaf segments following a high temperature treatment using a simple conductometric technique. Therefore, the CMS is a simple as well as a rapid method for identifying high-yielding genotypes tolerant to heat stress (Saadalla et al. 1990b). The TTC assay or cell viability test is based on the reduction of the tetrazolium to formazan after a high temperature treatment (Blum 1988). The positive relationship between CMS and high grain yield under heat stress has been long reported in wheat (Blum et al. 2001; Ibrahim and Quick 2001; Dhanda and Munjal 2006; Omara et al. 2006; Yildirim et al. 2009; Omara et al. 2010; Sharma et al. 2014; Rehman et al. 2016; ElBasyoni et al. 2017). The CMS was also found to be correlated with TTC under heat stress (Satyavir and Handa 2012; Aochen and Prakash 2015; El-Rawy 2015). Moreover, genotypic variation has been reported among wheat genotypes using the CMS (Saadalla et al. 1990a) and the TTC tests (Porter et al. 1994). Evidently, the information on the genetic system controlling heat tolerance related traits is of great importance for wheat breeding (Kumar et al. 2017). In this regard, the diallel analyses provide detailed and useful information regarding the genetic systems controlling important quantitative traits (Hayman 1954a, b). Moreover, the half diallel mating design is an effective method for identifying genotypes with higher combining ability to be used for developing improved cultivars (Jinks 1954). Therefore, in the present study a nine-parent half diallel cross of bread wheat evaluated under favorable (normal sowing date) and heat stress (late sowing date) conditions was used to estimate GCA and SCA of cellular thermotolerance assessed by CMS and TTC tests. The plant materials utilized composed of nine bread wheat genotypes (Triticum aestivum L.), quite variable regarding grain yield, physiological and agronomic traits as well as their performance under heat stress (Table 1). The field evaluations of the study were conducted at Faculty of Agriculture Farm, Assiut University, Egypt. In 2014/2015 winter season, the nine parental genotypes were crossed in a diallel pattern without reciprocals to produce 36 F1 hybrids. In 2015/2016 season, seeds of the nine parental genotypes and their 36 F1 hybrids were planted on 21st November as a normal sowing date and 28th December 2015 as a late sowing date (heat stress condition). Each of the nine parents and their 36 F1’s were represented in each block by a one row plot of 10 plants with rows spaced 50 cm apart while plants within rows were spaced 30 cm from each other. The plant samples for CMS and TTC assays were collected at the flowering stage. The CMS assay was performed using Fokar et al. (1998) method. The CMS (%) was calculated according to Blum and Ebercon (1981). The TTC reduction (%) was measured using Ibrahim and Quick (2001). After the maturity stage, grain yield per plant (GYP), 1000-kernel weight (TKW) and stem diameter (STD) were recorded. A heat tolerance index (HTI) was adjusted based on TKW under favorable and heat stress conditions according to Fernandez (1992). The recorded temperatures during March and April 2016 were provided by Agriculture Meteorological Station at Assiut Governorate and indicated that heat waves have occurred with temperature rising above 34°C for several days which coincided with the post flowering stages of plant development (Fig. 1). The diallel analysis (Hayman 1954a,b; Mather and Jinks 1971) was performed using “DIAL98” software (Ukai 2006). Modifications for the half diallel cross (Jones 1965) were also applied. Different components of Genetic and environmental variance as well as broad-sense (h2B) and narrow-sense (h2N) heritability were measured. GCA and SCA as measures of additive and non-additive genetic effects were also estimated for each trait. The present study was carried out to investigate the gene action and assess GCA and SCA of the cellular thermotolerance evaluated by CMS and TTC tests in a nine-parent half diallel cross of bread wheat under favorable and heat stress conditions. The means of the nine parents and their 36 F1 hybrids of the traits studied are presented in Table 2. The parental genotypes as well as their F1’s responded differentially under heat stress. GYP, TKW and STD were chosen for the field evaluation as they are the most traits influenced by heat stress, and thus affect wheat grain yield. The overall mean of GYP, TKW and STD of all parental genotypes were reduced by 17.07, 9.12 and 15.44%, respectively. Meanwhile, GYP, TKW and STD overall F1 hybrids were reduced by 15.15, 13.88 and 14.94%, respectively. On average and compared with their parents, the F1 hybrids significantly produced higher GYP under both favorable and heat stress conditions, higher TKW under favorable condition as well as larger CMS, TTC and HTI. The parental means ranged from 50.18 (P5) to 65.56 (P9) for CMS, 34.17 (P4) to 55.36 (P1) for TTC and from 0.57 (P4 and P8) to 0.99 (P2) for TTC, with an average of 59.46, 44.59 and 0.79, respectively. The means of F1 hybrids ranged from 50.73 (P3 × P5) to 72.98 (P1 × P8) for CMS, 29.89 (P3 × P5) to 58.33 (P1 × P8) for TTC and from 0.58 (P4 × P8) to 1.17 (P1 × P2) for HTI, with an average of 62.15, 45.04 and 0.90, respectively. Under heat stress condition, P2 produced greater GYP (45.82 g) followed by P1 (43.78 g). However, P9 showed the highest TKW value (44.75 g), while the greater STD (6.41 mm) was recorded for P1. In addition, P9 showed the greater CMS (65.56%), while P1 showed the highest TTC (55.36%), and the highest HTI value (0.99) was recorded for P2 (Table 2). Highly significant differences (P < 0.01) due to the genotypes were observed for all the traits studied (Table 3), indicating the presence of abundant genetic variability among parental genotypes and their F1’s. Highly significant (P < 0.01) GCA and SCA effects were also recorded with the mean squares of GCA being much greater than that of SCA, indicating a predominance of GCA than SCA effects for all the traits. Highly significant (P < 0.01) additive (a) and non-additive (b) gene actions were observed (Table 4), with the mean squares of the (a) item were greater than that of the (b) item for all the traits studied. On partitioning the non-additive gene effect (b) item into its components; the significance of the (b1) item obtained for all the traits except in TTC, indicated directional dominance. The significant (b2) item obtained with all the traits except TKW under favorable condition, CMS and HTI indicated asymmetrical distribution of genes affecting the trait at loci showing dominance. Meanwhile, the significant (b3) item obtained with all the traits studied indicated further dominance effects due to specific combination and/or epistasis. Estimates of different components of the genetic variance of the traits studied are presented in Table 5. The dominance genetic variance (H1) of GYP was greater in magnitude than the additive variance (D) under favorable condition, while the D value was, in some extent, greater than the H1 value under heat stress. Unlike, the additive genetic variance (D) of TKW and STD under favorable and heat stress conditions as well as HTI was greater in magnitude than the dominance variance (H1). As for CMS and TTC, the H1 value was greater in magnitude than the D value, indicating the important role of the dominance genetic variance for both traits. The broad-sense heritability (h2B) ranged from 0.80 for HTI to 0.94 for TTC. However, the narrow-sense heritability (h2N) ranged from 0.51 for GYP under favorable condition to 0.81 for STD under favorable condition. The narrow-sense heritability obtained for CMS, TTC and HTI were 0.52, 0.57 and 0.71, respectively. The positive value of (F) obtained for GYP under heat stress condition as well as TTC (Table 5) suggested that the dominant alleles are more frequent in the parents than the recessive alleles. Whereas, the negative values observed in the remaining cases suggested that the recessive alleles are more frequent. The (H1/D)1/2 values of GYP under favorable condition, CMS and TTC were 1.58, 1.38 and 1.32, respectively, indicating an overdominance. However, the ratio of (H1/D)1/2 was smaller than one in the remaining cases, indicating a partial dominance. The uv value (H2/4H1) was less than 0.25 for all the studied traits, indicating unequal distribution of dominant and recessive alleles among the parental genotypes, which was indicated previously from the significance of (b2) item. 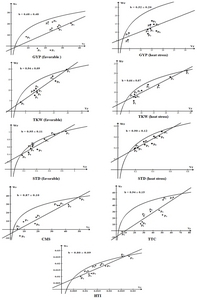 The regression analysis of the covariance (Wr) on the variance (Vr) (Table 6) indicating that the slope of the regression line was significantly deviating from zero but not from unity for TKW under favorable condition (b = 0.94 ± 0.09), STD under favorable (b = 0.95 ± 0.11) and heat stress (b = 0.90 ± 0.12) conditions, CMS (b = 0.87 ± 0.10), TTC (b = 0.94 ± 0.15) as well as HTI (b = 0.80 ± 0.09), indicating full adequacy of an additive-dominance model. However, the regression coefficients were significantly different from zero and also from unity for GYP (b = 0.52 ± 0.20) and TKW (b = 0.66 ± 0.07) under heat stresses, indicating the partial adequacy of the genetic model. Highly significant (Wr + Vr) mean squares were observed in all the traits studied except GYP under favorable condition, indicating the presence of a significant dominance variance. Unlike, the differences in (Wr − Vr) values were non-significant in all the studied traits except TKW under heat stress, confirming the absence of epistasis. The graphical analysis of Wr/Vr relationships (Fig. 2) indicated that the regression line of GYP under favorable condition, CMS and TTC seemed to intercept the Wr axis below the origin indicating overdominance, whereas the intercept of the regression line on the Wr axis lies in a positive position for the remaining traits indicating a partial dominance, which were indicated previously from (H1/D)1/2. The relative order of the (Wr, Vr) points along the regression line showed that the parent P1 possessed a high proportion of recessive alleles for CMS and TTC. Whereas, P9 contained a majority of dominant alleles for CMS and P6 possessed a high proportion of dominant alleles for TTC. As for HTI, P3 possessed a high proportion of recessive alleles and P2 contained a majority of dominant alleles. The correlation coefficients between the parental order of dominance (Vr + Wr) and the parental mean (Yr) for CMS, TTC and HTI (Fig. 3) indicated significant and negative correlation coefficient (r = −0.71) for CMS, suggesting that recessive alleles contribute to a lower CMS. However, non-significant coefficients were observed for TTC and HTI, indicating that recessive alleles contribute to both positive and negative effects. Estimates of GCA effects of the parental genotypes for the traits studied are presented in Table 7. Under favorable condition, the parent P3 exhibited the highest significant and positive GCA values for GYP (3.67) and STD (0.76), whereas the highest GCA for TKW was found in P2 (3.27). Under heat stress, P1 possessed the highest significant and positive GCA values for GYP (3.84) and STD (0.58), while P2 possessed the highest GCA for TKW (3.16). It is also observed that the highest significant and positive GCA value for CMS (4.45) was obtained with P9, while P1 possessed the highest significant and positive GCA values for TTC (4.24) and P2 possessed the highest GCA for HTI (0.14). Further dominance and/or epistasis effects due to specific combinations were observed in the F1 hybrids (Table 8). The highest significant and positive SCA values for GYP under favorable and heat stress conditions were found in P1 × P7 (5.80) and P3 × P6 (5.79), respectively. However, P1 × P3 and P2 × P7 produced the highest SCA values for TKW under favorable (3.05) and heat stress (4.34) conditions, respectively. Greater significant and positive SCA effects were found in the crosses P1 × P8 (8.13) P5 × P9 (9.08) for CMS and in the crosses P4 × P9 (7.71) and P5 × P6 (10.58) for TTC, while the highest positive SCA for HTI (1.41) were exhibited by the crosses P1 × P2 and P8 × P9. The correlation coefficients among different traits under heat stress (Table 9) indicated that GYP was significantly correlated with TKW (r = 0.49; P < 0.01), STD (r = 0.39; P < 0.01), CMS (r = 0.62; P < 0.01), TTC (r = 0.63; P < 0.01) and HTI (r = 0.60; P < 0.01). It is also observed that TKW was significantly correlated with STD (r = 0.50; P < 0.01), TTC (r = 0.37; P < 0.05) and HTI (r = 0.96; P < 0.01). However, non-significant correlation was obtained between TKW and CMS (r = 0.28; P > 0.05). 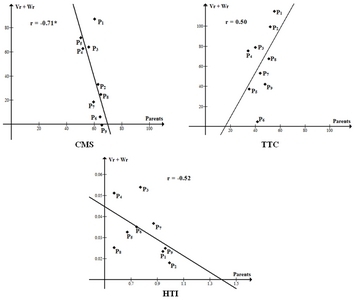 A highly significant and positive correlation was obtained between CMS and TTC (r = 0.73; P < 0.01), and a significant correlation was also obtained between TTC and HTI (r = 0.38; P < 0.05). However, non-significant correlation was found between CMS and HTI (r = 0.27; P > 0.05). Terminal heat stress is a serious threat for wheat cultivation causes severe yield loss; thereby there is a dire need to develop high-yielding and heat tolerant varieties. Knowledge about the genetic system controlling heat tolerance related traits could provide a good opportunity to select the best parents and cross combinations to develop high-yielding genotypes under heat stress (Farooq et al. 2011). Therefore, the present study was carried out to investigate the gene action and assess GCA and SCA of the cellular thermotolerance evaluated by CMS and TTC cell viability tests in a nine-parent half diallel cross of bread wheat under favorable and heat stressed field conditions. The results indicated that heat stress of the late sowing date caused significant reductions in GYP, TKW and STD by 17.07, 9.12 and 15.44% overall parental genotypes and 15.15, 13.88 and 14.94% overall F1 hybrids, respectively. Accordingly, several investigations reported that GYP and TKW were significantly reduced in response to heat stress of the late sowing date (El-Rawy 2015; Hassan 2016; Hassan et al. 2016). In this regard, Suleiman et al. (2014) reported that the late sowing date shortened the development stages of wheat plants resulting in reduced grain yield. High temperature affects crops in different ways and growth stages resulting in production of fewer kernels with smaller kernel weight (Ugarte et al. 2007; Asseng et al. 2011). These effects could vary depending on crops, genotypes as well as the phenological stages (Akter and Islam 2017). Evidently, the parental genotypes and their F1’s responded differentially under heat stress. On average, the F1 hybrids significantly produced higher GYP compared with their parents under both favorable and heat stress conditions as well as larger CMS, TTC and HTI, indicating a transgressive segregation. Highly significant GCA and SCA effects were observed for all the traits with the mean squares of GCA being much greater than that of SCA. Furthermore, highly significant additive (a) and non-additive (b) gene actions were also involved in the inheritance of all the traits with a predominance of the additive gene action. However, the dominance genetic variance of GYP under favorable condition as well as CMS and TTC was greater than the additive variance, while a predominance of the additive variance was observed in GYP under heat stress, TKW and STD under favorable and heat stress conditions as well as HTI. Similar results were found by Ibrahim and Quick (2001) in wheat as they found significant GCA and SCA effects for membrane thermostability. Furthermore, Dhanda and Munjal (2009) reported that the GCA mean square of the membrane thermostability was higher than that of SCA; however, the dominance variance was more important. Fokar et al. (1998) reported the dominant nature of gene action controlling the acquired thermotolerance measured by TTC in bread wheat, while the genetic variation was largely due to additive variance. Dhanda and Munjal (2006) reported the presence of the additive and dominant gene effects for membrane thermotolerance in wheat. Dhanda and Munjal (2009) reported that the dominance component of variance was greater than the additive component for CMS. The joint regression analysis revealed full adequacy of a simple additive-dominance genetic model was full adequate for TKW under favorable condition, STD under both favorable and heat stress conditions, CMS, TTC as well as HTI. Accordingly, Farooq et al. (2011) indicated the full adequacy of a simple additive-dominant model for CMS under both normal and heat stress conditions. It is also observed that GYP and TKW under heat stresses condition exhibited a partial adequacy of the additive-dominance model. GYP under favorable condition as well as CMS and TTC exhibited an overdominance, whereas a partial dominance was adopted for the remaining traits. High broad-sense (h2B) and moderate to high narrow-sense (h2N) heritability were observed for all the traits. The h2B estimates for CMS, TTC and HTI were 0.91, 0.94 and 0.80; whereas the h2N estimates were 0.52, 0.57 and 0.71, respectively. Similarly, El-Rawy and Youssef (2014) reported high broad sense heritability (0.78) for CMS in wheat under heat stress. They also reported a high genetic advance for CMS under heat stress, and thus CMS would be controlled by additive gene action. Clearly, heritability estimates obtained in the present study for CMS were higher than those obtained by Ibrahim and Quick (2001), ranged from 0.27 to 0.47. GYP was significantly correlated with CMS (r = 0.62), TTC (r = 0.63) and HTI (r = 0.60). TKW was significantly correlated with TTC (r = 0.37) and HTI (r = 0.96). However, non-significant correlation was found between TKW and CMS (r = 0.28). In addition, a highly significant and positive correlation was obtained between CMS and TTC (r = 0.73), and a significant correlation was also found between TTC and HTI (r = 0.38). In accordance, El-Rawy (2015) found significant and positive correlations between GYP with CMS and TTC, as well as TKW was positively correlated with CMS and TTC. Similar positive correlations were also reported between CMS and grain yield under heat stress conditions in wheat by Shanahan et al. (1990), Reynolds et al. (1994), Fokar et al. (1998), Blum et al. (2001), Ibrahim and Quick (2001), Dhanda and Munjal (2006), Omara et al. (2006), Yildirim et al. (2009), Omara et al. (2010), Sharma et al. (2014), Rehman et al. (2016) and ElBasyoni et al. (2017). In addition, Satyavir and Handa (2012) found that the CMS was positively correlated with TTC under heat stress. A highly significant and positive correlation was also reported by El-Rawy (2015) between CMS and TTC. Aochen and Prakash (2015) found highly significant and positive correlations between CMS and TTC at seedling and anthesis stages. They also found that TKW were significantly and positively correlated with CMS and TTC at both seedling and anthesis stages. The present study concluded that the parents P9, P1 and P2 could be considered as the best general combiners for CMS, TTC and HTI respectively. Moreover, six crosses were identified as the best promising combinations for CMS (P1 × P8 and P5 × P9), TTC (P4 × P9 and P5 × P6) and HTI (P1 × P2 and P8 × P9). In this regard, Griffing (1956) reported that the high GCA effects are mostly due to the additive gene effects or additive X additive interactions, whereas SCA effects represent the dominance and epistatic interactions, which can be related to the heterosis. It was observed that none of the high general combiners for GYP were high or at least average combiners for all the desirable traits related to heat tolerance. This result could be due to the fact that heat tolerance is a complex response affected by different cellular components and presumably controlled by multiple genes. Therefore, there is a need for further improvement of the combining ability for component traits under heat stress. The CMS technique has been widely used to identify heat-tolerant genotypes in wheat (Saadalla et al. 1990a, b; Shanahan et al. 1990; Tahir and Singh 1993; Reynolds et al. 1994; Fokar et al. 1998; Blum et al. 2001; Dhanda and Munjal 2006; Omara et al. 2006; Yildirim et al. 2009). Conducting a CMS assay on seedlings was appropriate for assaying heat tolerance of wheat which could predict the thermotolerance of the fully developed plant. However, its main disadvantage is the limited number of plants that can be processed in a controlled environment facility. Assaying CMS in seedling stage also destroys the plant; thereby it cannot be used for early generations like F2. Yildirim et al. (2009) indicated that CMS or relative injury can be used as complementary tools in breeding programs for screening heat tolerant wheat and evaluation of genetic variation in among genotypes. Thus, TTC reduction test has been used to test the cell viability of plant tissues exposed to a high temperature treatment (Mullarkey and Jones 2000; Ibrahim and Quick 2001; Yildiz and Terzioglu 2006; Yildiz and Terzi 2008). The CMS and TTC assays gave similar results when a limited number of genotypes were compared as reported by Chen et al. (1982). Although the cellular thermotolerance in terms of TTC is highly heritable and correlated to that of CMS, Fokar et al. (1998) reported that TTC is less predictive of plant performance under heat stress than CMS. In conclusion, the parental genotypes identified here as good combiners for CMS, TTC and HTI, as well as F1 hybrids exhibiting higher SCA could be used for developing high-yielding genotypes tolerant to heat stress. The study also supported that CMS and TTC could be used as effective selection criteria for heat tolerance in wheat. Fig. 1. Maximum daily temperatures during March 2016 (A) and April 2016 (B) at the experimental site. Fig. 2. The Wr/Vr graphs of the studied traits; GYP, TKW and STD under favorable and heat stress conditions as well as CMS, TTC and HTI. Fig. 3. Correlation coefficients between the parental order of dominance (Vr + Wr) and the parental mean (Yr) for CMS, TTC and HTI. Names, pedigree and origin of bread wheat genotypes used in the study. Mean performance of the parental genotypes and their F1 hybrids obtained by a 9-parentdiallel cross under favorable and heat stress conditions. GYP: grain yield/plant, TKW: 1000-kernel weight, STD: stem diameter, CMS: cell membrane thermostability, TTC: tetrazolium chloride reduction. Mean square (M.S) due to genotypes as well as general (GCA) and specific (SCA) combining ability for studied traits under favorable and heat stress conditions. stand for significant differences at the 0.05 and 0.01 probability levels, respectively. Hayman analysis of variance for the traits studied in a 9-parenthalf diallel cross of bread wheat under favorable and heat stress conditions. Estimates of genetic components of variance and related statistics for studied traits in a 9-parentdiallel cross under favorable and heat stress conditions. D and H1: additive and dominance effect, H2: proportion of dominance due to positive and negative effect of genes, F: mean of ‘Fr’ over arrays (Fr: covariance of additive and non-additive effects), E: environmental variation, (H1/D)1/2: the mean degree of dominance, u and v: the proportion of positive and negative alleles, h2B and h2N: broad- and: narrow-sense heritability, respectively. Joint regression analysis and mean squares of (Wr + Vr) and (Wr − Vr) in a 9-parenthalf diallel cross of bread wheat under favorable and heat stress conditions. b: Regression coefficient, Wr: covariance and Vr: variance of parental arrays. Estimates of general combining ability (GCA) effects of nine parental genotypes for the studied traits. Estimates of specific combining ability (SCA) effects of the F1 hybrids. Correlation coefficients among different traitsunder heat stress condition. GYP: grain yield/plant, TKW: 1000-kernel weight, STD: stem diameter, CMS: cell membrane thermostability, TTC: tetrazolium chloride reduction, HTI: heat tolerance index. Akter, N, and Islam, MR (2017). Heat stress effects and management in wheat. A review. Agron Sustain Dev. 37, 37. Aochen, C, and Prakash, P (2015). 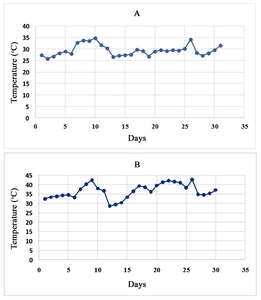 Evaluation of cellular thermotolerance and associated heat tolerance in wheat (Triticum aestivum L.) under late sown condition. Indian J Agric Res. 49, 522-527. Asseng, S, Foster, I, and Turner, NC (2011). The impact of temperature variability on wheat yields. Glob Chang Biol. 17, 997-1012. Blum, A, and Ebercon, A (1981). Cell membrane stability as a measure of drought and heat tolerance in wheat. Crop Sci. 21, 43-47. Blum, A, Natalya, K, and Nguyen, HT (2001). Wheat cellular thermotolerance is related to yield under heat stress. Euphytica. 117, 117-123. Chen, HH, Shen, ZY, and Li, PH (1982). Adaptability of crop plants to high temperature stress. Crop Sci. 22, 719-725. Dhanda, SS, and Munjal, R (2006). Inheritance of cellular thermotolerance in bread wheat. Plant Breed. 125, 557-564. Dhanda, SS, and Munjal, R (2009). Cell membrane stability: Combining ability and gene effects under heat stress conditions. J Cereal Res Commun. 37, 409-417. ElBasyoni, I, Saadalla, M, Baenziger, S, Bockelman, H, and Morsy, S (2017). Cell membrane stability and association mapping for drought and heat tolerance in a worldwide wheat collection. Sustainability. 9, 1606. El-Rawy, MA (2015). Divergent phenotypic selection and molecular marker analysis for heat tolerance in bread wheat (Triticum aestivum L). J Agric Chem Biotechn. 6, 301-319. El-Rawy, MA, and Youssef, M (2014). Evaluation of drought and heat tolerance in wheat based on seedling traits and molecular analysis. J Crop Sci Biotech. 17, 183-189. Farooq, J, Khaliq, I, Kashif, M, Ali, Q, and Mahpara, S (2011). Genetic analysis for relative cell injury percentage and some yield contributing traits in wheat under normal and heat stress conditions. Chilean J Agric Res. 71, 511-520. Fernandez, GCJ 1992. Effective selection criteria for assessing plant stress tolerance., Proceedings of a symposium on “Adaptation of Vegetables and other Food Crops in Temperature and Water Stress”, Taiwan, pp.257-270. Fokar, M, Nguyen, HT, and Blum, A (1998). Heat tolerance in spring wheat. I. Estimating cellular thermotolerance and its heritability. Euphytica. 104, 1-8. Griffing, B (1956). Concept of general and specific combining ability in relation to diallel crossing system. Aust J Biol Sci. 9, 463-493. Hassan, MI (2016). Assessment of genetic diversity in bread wheat genotypes based on heat tolerance and SSR markers. Assiut J Agric Sci. 47, 37-55. Hassan, MI, Mohamed, EA, El-Rawy, MA, and Amein, KA (2016). Evaluating interspecific wheat hybrids based on heat and drought stress tolerance. J Crop Sci Biotech. 19, 85-98. Hayman, BI (1954a). The analysis of variance of diallel tables. Biometrics. 10, 235-244. Hayman, BI (1954b). The theory and analysis of diallel crosses. Genetics. 39, 789-809. Ibrahim, AMH, and Quick, JS (2001). Heritability of heat tolerance in winter and spring wheat. Crop Sci. 41, 1401-1405. Jinks, JL (1954). The analysis of continuous variation in diallel cross in Nicotiana rustica varieties. Genetics. 39, 767-788. Jones, RM (1965). Analysis of variance of the half diallel table. Heredity. 20, 117-121. Kumar, S, Singh, SK, Gupta, SK, Vishwanath, , Yadav, P, and Kumar, S (2017). Combining ability in relation to wheat (Triticum aestivum L.) breeding programme under heat stress environment. Int J Curr Microbiol App Sci. 6, 3065-3073. Mullarkey, M, and Jones, P (2000). Isolation and analysis of thermotolerant mutants of wheat. J Exp Bot. 51, 139-146. Ni, Z, Li, H, Zhao, Y, Peng, H, Hu, Z, and Xin, M (2018). Genetic improvement of heat tolerance in wheat: Recent progress in understanding the underlying molecular mechanisms. Crop J. 6, 32-41. Omara, MK, Ibrahim, EMA, El-fatah, BE, and El-Rawy, MA (2010). Selection for cell membrane thermostability and stomatal frequency under drought and heat stress conditions in wheat (Triticum aestivum L). Assiut J Agric Sci. 41, 74-100. Omara, MK, Mohamed, NA, El-Sayed, EN, and El-Rawy, MA (2006). Selection for cell membrane thermostability in bread wheat (Triticum aestivum L.). Assiut J Agric Sci. 37, 61-76. Porter, DR, Nguyen, HT, and Burke, JJ (1994). Quantifying acquired thermal tolerance in wheat. Crop Sci. 34, 1686-1689. Rehman, SU, Bilal, M, Rana, RM, Tahir, MN, Shah, MKN, and Ayalew, H (2016). Cell membrane stability and chlorophyll content variation in wheat (Triticum aestivum) genotypes under conditions of heat and drought. Crop Pasture Sci. 67, 712-718. Reynolds, MP, Balota, M, Delgado, MIB, Amani, I, and Fischer, RA (1994). Physiological and morphological traits associated with spring wheat yield under hot, irrigated conditions. Aust J Plant Physiol. 21, 717-730. Saadalla, MM, Quick, JS, and Shanahan, JP (1990a). Heat tolerance in winter wheat: II. Membrane thermostability and field performance. Crop Sci. 30, 1248-1251. Saadalla, MM, Shanahan, JF, and Quick, JS (1990b). Heat tolerance in winter wheat. I. Hardening and genetic effects on membrane thermostability. Crop Sci. 30, 1243-1247. Satyavir, S, and Handa, DM (2012). Heat tolerance in relation to acquired thermotolerance for membrane lipids in bread wheat. Field Crops Res. 135, 30-37. Shanahan, JF, Edwards, IB, Quick, JS, and Fenwick, JR (1990). Membrane thermostability and heat tolerance of spring wheat. Crop Sci. 30, 247-251. Sharma, P, Sindhu, S, Manoj, S, Ajay, V, Bhudev, ST, and Sharma, I (2014). Assessing genetic variation for heat tolerance in synthetic wheat lines using phenotypic data and molecular markers. Aust J Crop Sci. 8, 515-522. Suleiman, AA, Nganya, JF, and Ashraf, MA (2014). Effect of cultivar and sowing date on growth and yield of wheat (Triticum aestivum L.) in Khartoum. Sudan J Forest Prod Indust. 3, 198-203. Tahir, M, and Singh, M (1993). Assessment of screening techniques for heat tolerance in wheat. Crop Sci. 33, 740-744. Ugarte, C, Calderini, DF, and Slafer, GA (2007). Grain weight and grain number responsiveness to pre-anthesis temperature in wheat, barley and triticale. Field Crops Res. 100, 240-248. Yildirim, M, Bahar, B, Koc, M, and Barutcular, C (2009). Membrane thermal stability at different developmental stages of wheat genotypes and their diallel cross populations. Tarim Bilimleri Dergisi. 15, 293-300. Yildiz, M, and Terzi, H (2008). Evaluation of acquired thermotolerance in wheat (Triticum aestivum and T. durum) cultivars grown in turkey. Pakistan J Bot. 40, 317-327. Yildiz, M, and Terzioglu, S (2006). Heat shock of cultivated and wild wheat during early seedling stage: growth, cell viability and heat shock proteins. Acta Biol Hung. 57, 231-246.